Revitalize your under eye skin Puriderma’s gold-infused gold gel eye masks that are remarkably refreshing and smoothing. Our gold eye masks gel pads are ultra gentle, safe, and dependable. Puriderma Gold Gel Eye Masks are responsibly formulated using premium quality ingredients that effectively reduces wrinkles, fine lines, crow's feet, puffiness, while nourishing skin for a bright, refreshed and supple appearance. Hydrate, protect, and restore your skin with our preferred choice gold gel eye masks. SOLUTIONS FOR: - Loss of firmness and elasticity - Wrinkles & fine lines - Dullness - Collagen production - Cellular turnover - Dryness - Puffiness - Dark Circles Which skin type is it good for? ? Normal ? Oily ? Combination ? Dry ? Sensitive Instructions: Apply the eye mask to clean, dry skin and leave on for 15-20 minutes. Remove mask and massage the remaining serum into the skin. Storage method: Use within one year after opening. Keep fresh in the refrigerator after each use. Caution: Patch test on the skin behind the ear before first use. Avoid direct contact with eyes. We stand behind every product we sell. We hope you will love our Gold Gel Eye Masks as much as we do! There is no risk for you! If you are not satisfied, we offer a 100% money back guarantee. - 100% SATISFACTION & MONEY BACK GUARANTEE - We hope you love our Hair Growth Vitamins as much as we do! There is no risk for you! If you are not satisfied, we offer a 100% money back guarantee. - SKIN LOVING INGREDIENTS - We've carefully curated the best skin loving ingredients that work deeply in the skin to combat tired and dull skin for a firmer, brighter, and illuminated eye area. 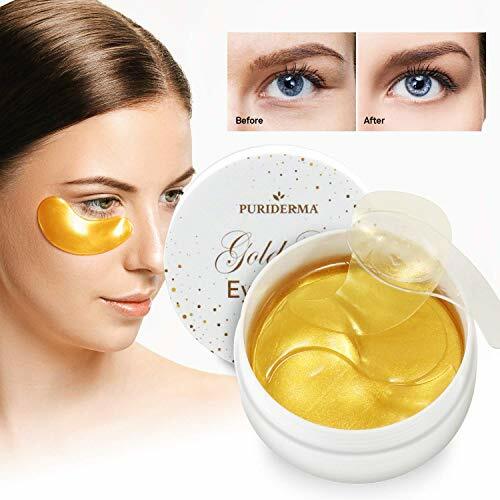 - ANTI-AGING FORMULA - Gently nourish, hydrate, tighten, and lift skin around the eyes, and reduce the appearance of wrinkles, fine lines, and puffiness with Puriderma Gold Gel Eye Masks! - NATURAL COLLAGEN BOOST - Plant-based collagen, natural extracts, and vitamins work together to stimulate and regenerate skin cells to combat signs of aging and sun damage. - GENTLE FOR ALL SKIN TYPES - Our safe and gentle gold gel eye masks are suitable for both men and women and for every type of skin including the most sensitive type.